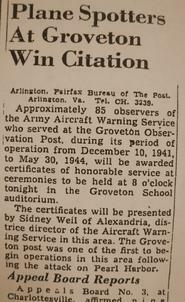 Historic Beacon Field, 25 April 2013 -- In 2009, Friends of Beacon Field Airport discovered historical documentation and newspaper articles commending the 85 observers who served at the Groveton Observation Post of the Army Aircraft Warning Service (AWS) during World War II. The award ceremony had been held at the historic Groveton School auditorium. W.F.P.Reid was appointed to the Civilian Defense Council in July 1942(1). 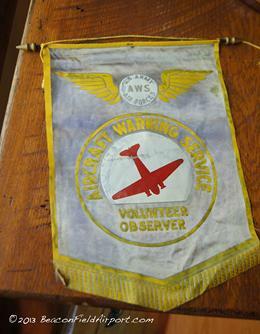 Friends of Beacon Field Airport conducted research and learned that the Groveton Observation Post located in the AWS 8th District(2) was one of the 7500 civilian posts in the nationwide warning service network that was manned 24 hours a day during the heightened security period of WWII. The posts were located in barns, church steeples, roof tops, or specially built observation sheds in strategic areas as shown in the newletter photo below. Many posts were staffed exclusively by women mainly due to the manpower deployed overseas. 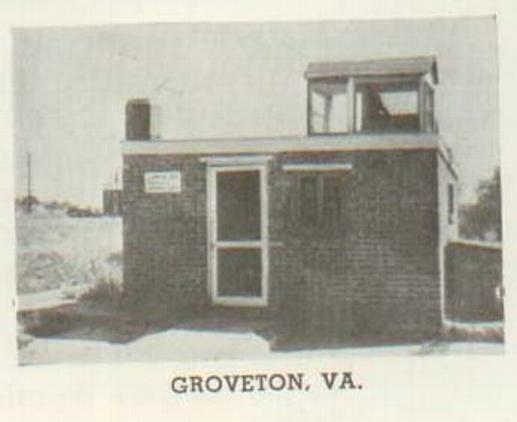 Without electricity until late in 1943, Groveton post duty was indeed arduous. The Washington Post reported the community club held a benefit game party for the installation of electric lights.